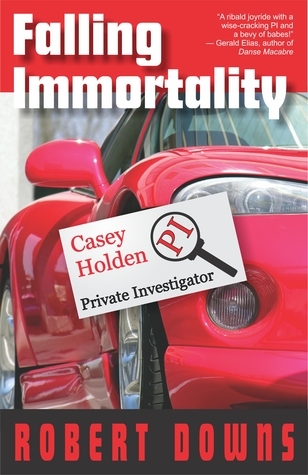 Today I have a guest post from Robert Downs, author of Falling Immortality: Casey Holden, Private Investigator. His book has been called MANfiction, and his post today is about what makes for good MANfiction. If you have a strong-willed private eye, or a cop with an axe to grind, then you might have found the perfect character for MANfiction, a term coined by Stephen King, and utilized by a variety of authors, such as Michael Connelly, Robert Crais, and the late Robert B. Parker. The perfect muscle car, while not essential, certainly increases the pace, and keeps the novel above the speed limit. Witty dialogue often proves appropriate and within character. Your PI or detective needs to discover trouble, and he needs to have the tools to fight his way out of whatever predicament he finds himself in the middle of, including a rooftop plunge, or being knocked over the head and tossed over the side of a yacht. Female characters, while not essential to create MANfiction, can’t be ignored, or mistreated, since you don’t want to alienate more than half your potential audience. And women deserve better, just as men often deserve better in women’s fiction. It’s a natural occurrence for strong-willed men to seek out strong-willed women. It creates a more intriguing storyline, and it creates a more powerful blast than that exhibited by Dirty Harry’s .44 Magnum. And it’ll keep your male, as well as your female, readers coming back for more.